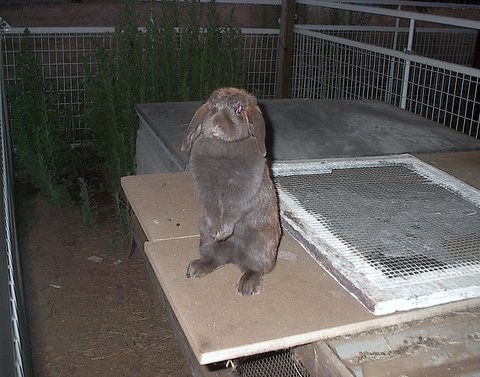 At some point every rabbit breeder is faced with the question of what to do with the rabbits that are too old to show or to be part of a breeding . Many breeders replace their stock every year or two with offspring and sell the parents to other breeders or to pet . 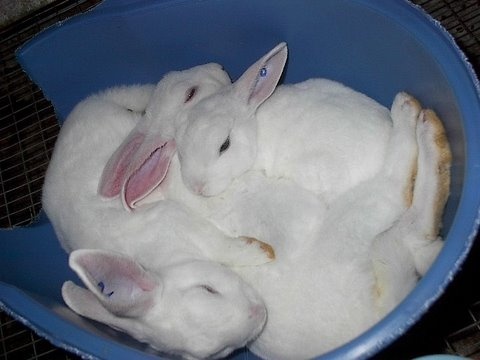 I tend to get too attached to my rabbits and when I realize they are no longer a productive part of the herd other breeders have no interest in them and some are just too crabby to be or just such favorites I can't bear to part with them so they stay forever. A few years ago Susan, a friend of mine, offered to take one or two of my "old ladies" up to her house to live out their lives with her neutered males. Well, somehow the tradition has continued. We then added some old bucks to the mix where they live in ground pens in colonies. The funny thing is that several of these old girls that I thought were past having babies go up to the county house and get pregnant! Just one baby here and there but they are thriving on the mountain air under Susan's contstant supervision! When they do finally die (at VERY OLD AGES!) they are buried on a hillside with a tile marker and statue carefully selected by Susan that remembers that particular bunny. I thought readers might enjoy seeing some photos of the retiement home and it's occupants. The swing at left provides relaxation while Susan enjoys the bunnies. The basic shelter above is divided into 8 foot long runs. The sides are now covered with lattice for and shaded by huge willow trees. The bunnies can dig tunnels and have lots of play areas. Just Adorable with his harem. Each run has open cages they can retreat into. A in a peanut box makes a snug napping place. Steel of the Night with her babies she was too old to have! Petit Fours thinks the top of the cage is her penthouse deck! When the weather is hot the kids move into the 3 car garage converted to bunny quarters. Kealea with her baby Indigo - Okay so she's not too old! Starbuck, Cranberry babysit Betsy's kids.